This program is designed to teach you all about the modes and how to best use them for Rock music and expand your playing to be able to utilize the whole entire fretboard when soloing, jamming and creating leads. 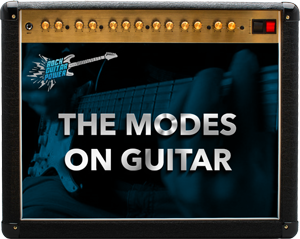 The modes can be a confusing topic to learn but after years of teaching them, I’ve found a very specific way that has worked time and time again for lots of students. The way that I approach teaching this theory principle has been created specifically for guitar and how to best apply them to this instrument. I’ve taken all the hard to understand, technical mumbo jumbo and put it into a context that is both easy to understand and make use of. To get started, watch the Welcome Video below and move at your own pace. Remember that to make this or any other concept or skill part of your regular playing takes consistent practice and dedication. As you start learning the content in this program, apply it right away to songs your jamming on or writing and it will quickly expand your abilities as a guitar player.